Poland, winter of 1945. Mathilde Beaulieu (Lou de Lâage) is a young intern working with a branch of the French Red Cross. They are on a mission to find, treat and repatriate French survivors of the German camps. One day, a Polish nun arrives in the hospital. In very poor French, she begs Mathilde to come to her convent. Mathilde life and beliefs change when she discovers the advanced state of pregnancy that affect several of the Sisters of the convent just outside the hospital where she performs. Maria: You know, faith. At first, We're like a child that his father holds by his hand, who feels safe. A moment comes and I think he always comes where the father will let you go. We're lost, alone in the dark. We call, nobody answers. We're getting ready, we're surprised. We're hit in the heart. That's the cross. Behind all joy, there is the cross. 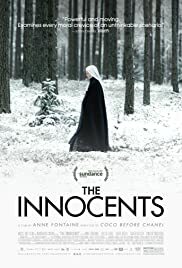 The French film Les innocentes was shown in the U.S. with the translated title The Innocents (2016). Anne Fontaine directed this powerful movie. The year is 1945, just after the end of World War II. A French Red Cross unit is sent into Poland. Their mission was to care for French survivors of the camps. Among the Red Cross staff is a young medical student, Mathilde Beaulieu, played by Lou de Laâge. Early in the film, we learn a terrible secret about the nuns in a nearby convent. Many of them are pregnant, because they were raped by Russian soldiers. Mathilde learns of this, and she is allowed to enter the convent, where she meets Sister Maria, a French-speaking nun played by Agata Buzek. To go further with the plot would diminish the movie, so I'll stop at that point. Let me just say that the situation is even worse than it seems. This is a movie that is not to be missed. Yes, it's grim, but postwar Poland was a grim place. The film takes place in winter, so snow covers everything, and even the Red Cross staff is miserable. Obviously, for the nuns in the convent, everything is much more terrible. The acting in the film by the two lead actors is outstanding. Also, the ensemble acting was wonderful. There were no weak links, and no obviously staged scenes. Everything looked real--cold, dark, and threatening--but real. This is one of those movies where many frames could be lifted from the film and used as a photograph. My compliments to cinematographer Caroline Champetier, who did a brilliant job. We saw this film at the excellent Little Theatre in Rochester, NY. It will work well enough on the small screen, but the large screen gives you a better sense of the isolation of the convent. The nuns don't expect help from outside. They only expect harm to come to them. Mathilde is the exception, and they (and we) understand that. Small screen or large screen, don't miss this movie! P.S. The film is based on the experiences of a French doctor--Madeleine Jeanne Marie Pauliac. She was a member of the French Resistance, and did, indeed work tirelessly in Poland after the war. For artistic reasons, director Fontaine focused on Dr. Pauliac's work with the pregnant nuns. The rest of her accomplishments would also make a fascinating movie.